If you’re into Icelandic and astronomy (and hey, who isn’t? :)) there’s a cool site at http://www.stjornufraedi.is/ filled with news, podcasts and all sorts of astronomy-related information. Right on the front page is a survey of the solar system, with short blurbs about each celestial body, and links to more in-depth material. It’s actually not too hard to follow, since it’s all basic material that most everyone already knows in their own language, so give it a shot. Menn eru frá Mars, konur eru frá Venus? og svo framvegis… 🙂 So when you see -kerfi, it’s a clue to some sort of system. The thumbnail for this post is taken from a section of the web page called Mynd vikunnar – Photo of the Week. 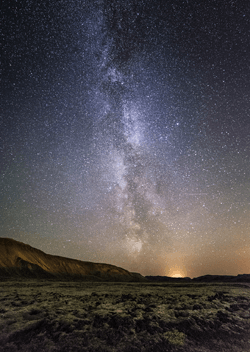 This week’s photo is an amazing shot of the Milky Way taken by Ómar Örn Smith near Hafnarfjörður on September 18th of last year, which is funny because I was actually in Iceland at that time 🙂 I came back with some good photos, but nothing quite like this. This page is titled Vegurinn til Valhallar – The Road to Valhalla. Þessi bók tilheyra bókasafninu. – This book belongs to the library.